“Order number 169,” the announcer clearly calls out the next order up. It kind of reminds me of a boxing match on TV and I wonder if “Leeet’s get ready to TRI TIP….” ding, ding, ding, will be the next words over the loudspeaker. Firestore Grill sits at the heart of downtown San Luis Obispo. 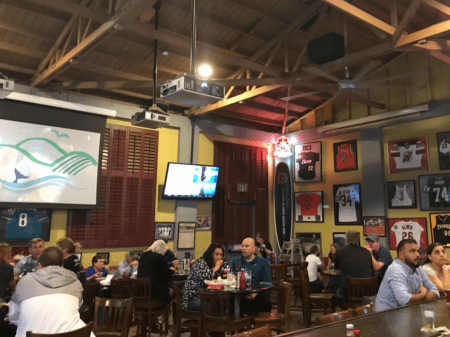 Located on Higuera Street between Osos and Santa Rosa, the large outdoor seating area is easy to spot from down the block… as is the line of customers that often streams out from the front door toward the sidewalk. But fear not. The line moves surprisingly quickly. Plus, waiting in line gives you a few more tantalizing moments to breathe in the BBQ smoke as you get closer to your goal. Their system of order, prep, and delivery is rock solid, and it’s never too long a wait connecting you and the coveted tri tip. When I first came to visit to San Luis Obispo to visit many years ago, this was the first place my hosts brought me to. Their advice: if you eat one thing in SLO, make it the Firestone Grill tri tip. I liked their conviction and confidence, getting right to the meat of the matter. We’d come for one thing. Tri-tip. I was ready to dive in. Before my first visit to SLO, I’d never heard of this magical cut of beef. Now that I’ve been here a few years, I’ve tried dozens of variations on Firestone Grill’s tri tip, with varying degrees of tasteful success. Tri tip is a huge Central Coast thing, and even the most modest apartment complex will have a mobile Santa Maria barbecue pit in the parking lot. What is tri tip (and why is it so delicious)? Tri-tip steak is cut from a tri-tip roast, which is a small, triangular cut from the sirloin. It is also known as a triangle steak, bottom sirloin steak, or Santa Maria steak. The tri-tip was popularized in California but is now more widely marketed, although you may need to request it from your butcher. 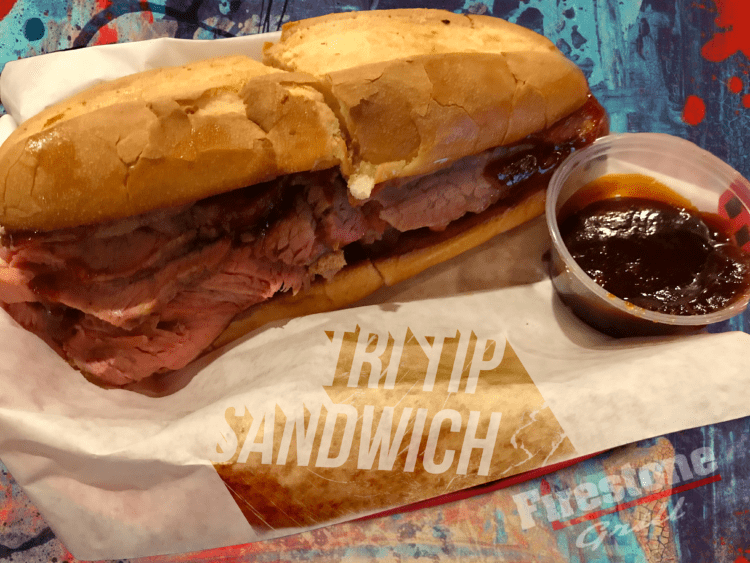 Firestone’s signature menu item is the beautifully cooked tri tip bbq sandwich. The tender, smoked beef is lightly coated in semi-sweet bbq sauce served on a french style bread (verify). It is big. I love to eat and even the half sandwich with some fries, onion rings, or a salad will fill you up. The problem is the sandwich is so good you usually dive into the second half, and before you know it, it’s all gone. If you show a little restraint, it’s the perfect sandwich to share or bring half home to enjoy later. Tip: You can ask for more sauce at the pick-up counter if you like a little more flavor. It’s good to try it first as-is to get a taste of the smoky beef goodness. You can always head up and get more sauce after a few bites. After a few times coming to Firestone and devouring the holy grail of tri tip sandwiches, we got bold. What about trying a few other items on the menu? Their tri-tip salad is just the thing — a hearty helping of the same BBQ tri-tip with a good mix of greens (minus the bbq sauce) and trimmings. Tip: Get a tri tip sandwich and a tri tip salad and share. Best of both worlds. Hmm… what should we call this heavenly duo? How about the Sandald? The Salwich? The San-san combo? We also love the Monster burger, and it is a monster. 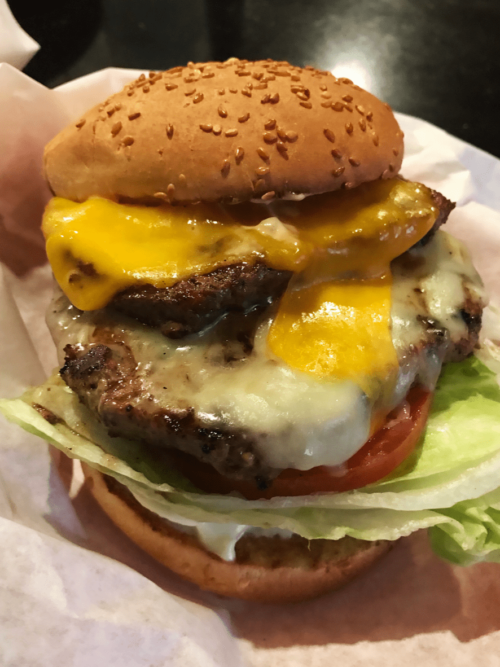 Two thick patties with Cheddar and Jack cheese, and about three feet tall. Ok, it’s not that tall. But it’s still a monster. Their other signature item is their fries. No thick-sliced fries here. Nope, these are skinny fries with a tasty sprinkle of flavor. You can order a side of fries or a basket. But we’ll warn you. The basket is huge — plenty to share with your friends. They have a full bar and inside seating, as well as the large patio with some good shade trees for those 350+ days of Central Coast sunshine. The patio is a great place to sit, enjoy your tri tip, and watch the city move and do its thing. The patio can also be a little more quiet than the inside seating. The order-calling speaker usually fades into the background, but it can be a little noisy inside when combined with the chatter of happy eaters. One good way to tell if people love a restaurant is when there is always a line. This place always seems busy, and it’s a good mix of locals and out-of-towners. Their rock-solid system to order, grill up your food, and get you on your way. Just like their fries, they are seasoned pros and it all flows. 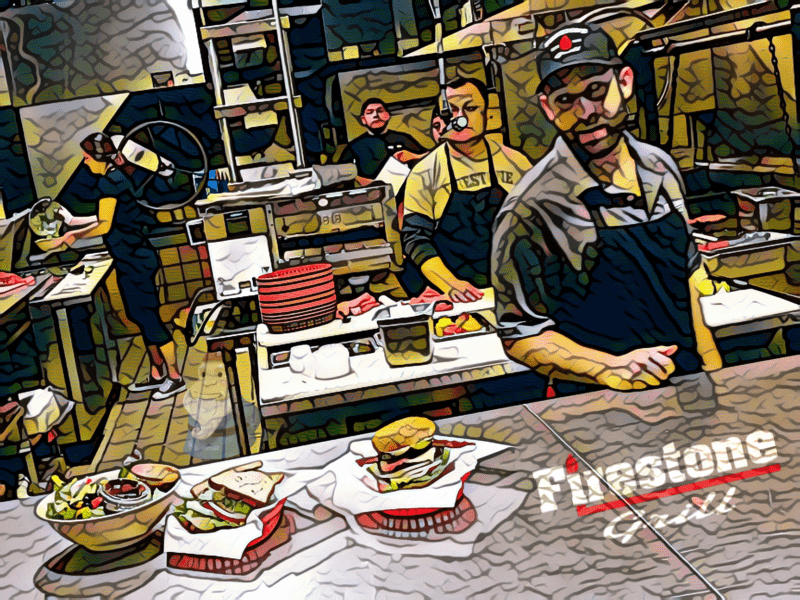 Whether you choose their iconic tri-tip sandwich, a monster burger, or a salad for your meal, you will leave Firestone Grill full and happy. So “Leeet’s get ready to TRI TIP!” Ding ding ding. We’ll see you there soon.